Here’s a place worth the trip across the West Seattle Bridge to come for a visit. Fresh Bistro, an Herban Feast Restaurant, pulls together some of the freshest tastes of the Northwest and creates mouth watering fabulous dishes to satiate even the most discerning of palettes. Last month I went with my friend Olivia for dinner. The next day I found out that I had Pancreatitis, for some unknown reason – unrelated to eating out, and I was put on a clear liquid diet for 2 weeks. That dinner at Fresh Bistro was my last meal of solid food, and it goes without saying that everyday I sipped broth and apple juice I was dreaming of the delightful fresh tastes served up to me that night. So let’s fast forward a few weeks, I’m finally back to eating chewable food. Joy of joys! 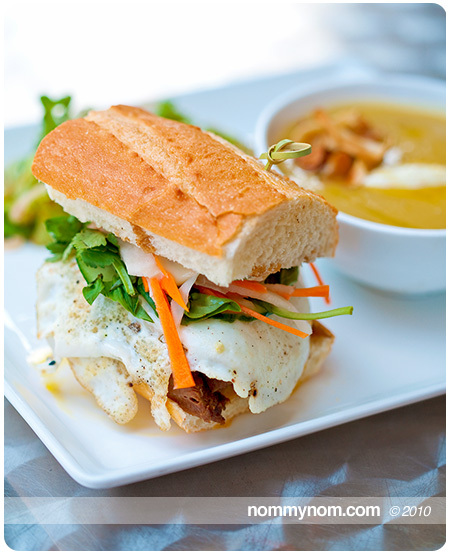 And the first place I want to re-visit is Fresh Bistro. I had 2 liquid weeks daydreaming of Pork Belly Bahn Mi, melt in your mouth Wagyu Beef, crisp Salads with tangy “vinny” and sous vide egg. To celebrate solid food my friend Cristie invited my niece and I to come to lunch with her. She kindly let me choose our lunchtime destination. Without a moment’s hestitation I blurted out “Fresh Bistro!” And so, off to Fresh Bistro we went. Fresh Bistro is located in the Mural Apartments Building, on the first floor, in West Seattle at the Alaska Junction. It’s street parking or you can use the underground parking across the street. The interior is earthy, classy and festooned with lush sustainable furniture, like their uniquely gorgeous Sorghum wood tables for inside dining. Their lunch menu is nice and is reasonably priced. The service is impeccable. The two times that I have been we have had the pleasure of being waited on by the new Front of the House Manager Robroy Chalmers (who is also a local artist whose work graces the walls in the restaurant) They have a knack for making you feel welcomed and special, and the staff is knowledgeable of the foods and drinks that they serve. 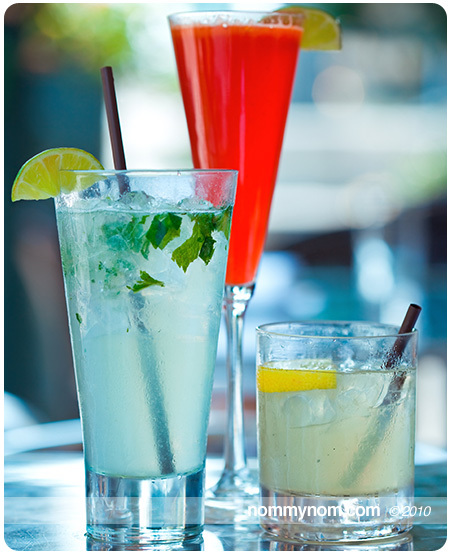 Speaking of drinks… you must try one of their seasonal signature drinks, complex and complimentary flavors. For as ambitious as they are, it pays off big time. Refreshing, interesting and delicious to sip. And don’t worry if you do not imbibe as they have a few special concoctions beyond the tired old Shirley Temple to tickle your taste buds so be sure to ask about their non-alcoholic offerings as well. Now let’s get to the food shall we? We’ll start with the appetizers. First off we had Sweet Potato Crab Cakes. 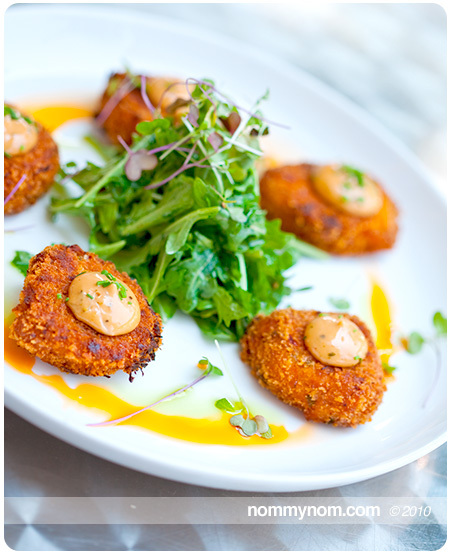 A crunchy exterior that yielded to a creamy inside where the flavors of crab and sweet potato melded with perfection. It was topped with a smoky chipotle remoulade that finished off the bite nicely. Next up for appetizers we tried the Shiso Crusted Prawns. When it arrived at the table we all gasped at the beautiful presentation. The Prawns were enormous, with a crispy breading infused with chopped shiso leaf. They were topped with an ethereal sriracha foam and complimented by a green mango pickle. 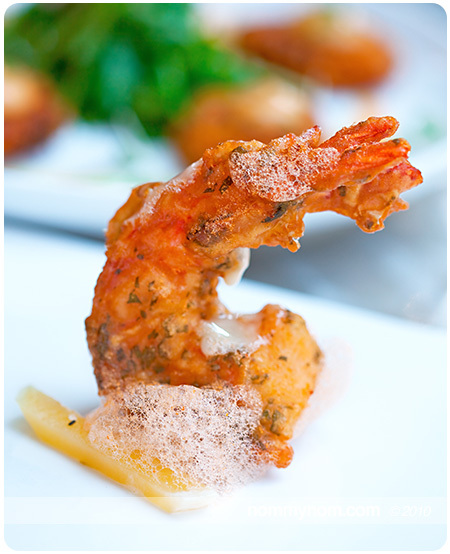 A savory, delicious bite tickled with the sweetness of the briny Prawn and a slight whisper of sriracha. These were my absolute favorite. Once we devoured the appetizers our lunch plates came out in a timely fashion. I ordered the Mexican Lunch Combo featuring tender Halibut Tacos, refried black beans, avocado corn salsa and spiced rice. The highlights for me were the perfectly cooked Halibut and the tangy-sweet red onion pickle. My niece ordered the Asian Lunch Combo which consisted of Pork Belly Bahn Mi, an Asparagus Soup with a Curried Goat Cheese Cannelle and an Asian inspired salad. She enjoyed the soup so much she could not put down her spoon. When she took a bite of the Pork Belly Bahn Mi all we could hear was “Mmmmm” in between chews with her eyes blissfully closed enjoying every single bite. Perfect layers of melt in your mouth pork, foie mayo, decadent fried egg with crisp carrot pickle, crunchy cucumber, fresh cilantro and basil. My friend had the Bistro Lunch Combo, with a Wagyu Beef French Dip, Mussels and a tarragon vin loaded Bistro Salad topped with a gorgeously poached egg. Let me just say this, I am not and never have been a fan of Mussels. 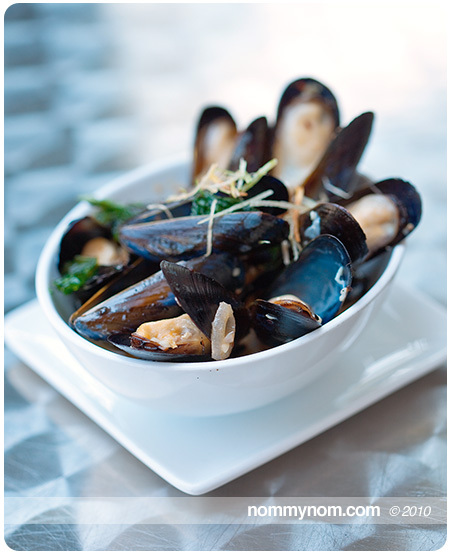 I find them to be very strong and offputting, but the mussels prepared at Fresh Bistro have changed my mind. They are absolute perfection, I loved them. Sweet mild Mussels in a butter broth that are heightened by a touch of rich landjaeger lardon made for a perfectly well balanced bite. I would order them again and again. 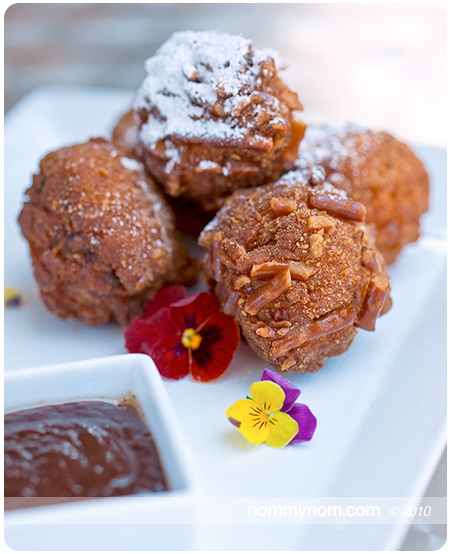 Lastly we moved on to dessert where we shared plates of Banana Pretzel Fritters with Homemade Nutella dipping sauce. It was like a donut and a loaf of banana bread had a baby and wrapped it in swaddling pretzels. Quite delicious and a generous portion to share. We also ordered up a dessert that I had right before I was relegated to a liquid diet. This dessert haunted me, it was so absolutely delicious that I had to get it again. 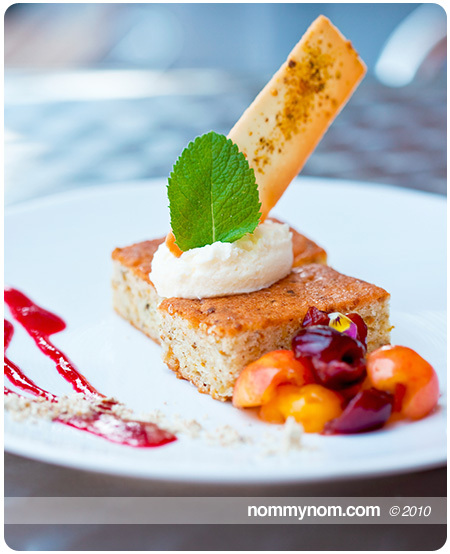 A Pistachio Financier with a brandied Cherry Coulis and this absolutely divine Mascarpone Orange Blossom Cream on top. It is a fresh tasting dessert that is not at all heavy on the sweet side. It is just sweet enough to keep you coming back at it. Overall it was a splendid lunch, spent with great people including the personable staff at Fresh Bistro. Would I go back? Yes, yes, 1000 times yes. Check them out for their special weekly Seafood Boils and Steak Nights. Reservations are highly recommended. Also keep in mind that Fresh Bistro changes up their menu to coincide with the changes in local and seasonal produce. So go enjoy the taste of fresh ingredients at their peak, masterfully put together into a delicious bite that will make your tummy happy. Full disclosure: I have received no compensation from Fresh Bistro , Herban Feast or any other organizations mentioned for this article. All content, text and images are ©2010 All Rights Reserved and may not be used or reposted without express written consent. 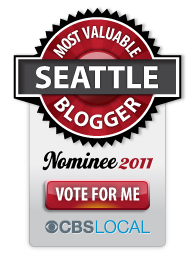 This entry was posted in Out & About, Restaurants and tagged bistro, food, fresh, fresh bistro, good food, herban feast, local, pacific northwest, places to eat, puget sound, Restaurant, review, seasonal, seattle, vegetarian friendly, West Seattle. Bookmark the permalink. OH NOMMY!!! Seeing the pics of our delicious lunch makes my mouth water!! I can’t wait to go back to Fresh Bistro!! It was a delight in every way!! These sound sooo good – wish I could be there to “Sip and crunch around the Sound” with you and Cristie Cocktail!